Liquid markup is a server-side language originally developed for the Shopify platform. It’s a fairly basic templating language, meant for handling logic like if then statements and loops. But, even though it’s pretty simple, it enables us to do some really cool things with Dynamics 365 Portals. I was working on a Partner Portal implementation and I tried adding some Liquid markup to the Entity List that a user sees on the Support page – it’s an Entity List of their active support cases called Customer Service – Cases List. I had copied some code from another project that I knew was functional, and yet it didn’t seem to work. Upon further inspection, I noticed that I could see my Liquid syntax in the source of the webpage – which is strange because normally Liquid markup is evaluated on the server, and all you see in the page markup is the results of the Liquid logic, not the original code. Entity List: Included via Liquid or via Server Control? I quickly identified the difference between when it worked and didn’t work: it depended on how the Entity List was included on the page. There are essentially two ways to include an entity list on a page: using Liquid tags, or using Page Templates that use the older-style ASPX Rewrites. When using the Rewrite Page Templates, Entity Forms, Entity Lists and Web Forms are included on the templates using ASP.NET Web Controls. These web controls find the Entity Form, Entity List, or Web Form related to the current page, and perform all the work of rendering them. As long as the Page Template you choose has these controls on them, the Entity Form, Entity List or Web Form will show up automatically, and the Liquid markup will be evaluated. If you are using the newer technique of defining Page Templates using Web Templates, you can include these elements using Liquid. There are Liquid tags that help you out with Entity Forms and Web Forms, and there is a built-in template that helps you out with Entity Lists. It’s this built-in template that is the source of our issue. 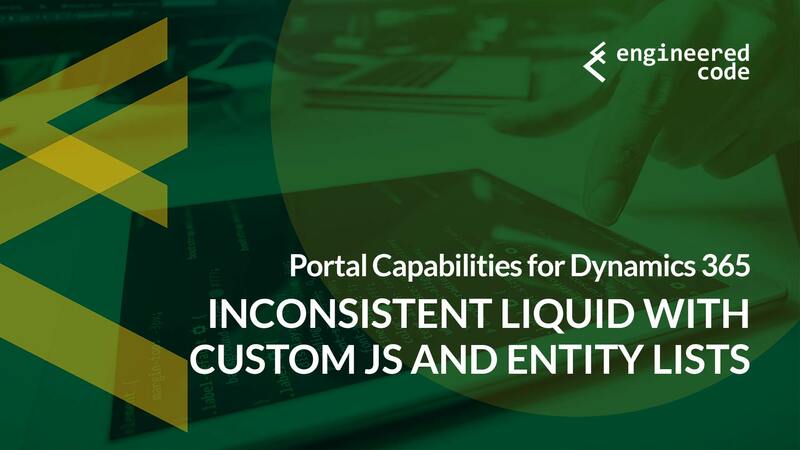 If you’re interested, you can download the Portal Source from here, or you can check out the Liquid file in question at the xRM Portal Community Edition on GitHub here. When you look at that file, you notice near the bottom that the adx_registerstartupscript attribute is place on the page, but any Liquid code that it might contain is not processed. On the other hand, if you look at the source code for the web control, available here, you’ll see around line 293 that any Liquid markup in the contents of the adx_registerstartupscript attribute are processed. Why Do Entity Forms and Web Forms Work Either Way? It turns out that the implementation of the Liquid tag for Entity Forms and Web Forms leverages the web controls. In fact, if you look in the code here, you’ll see that the Liquid tag simply puts in a placeholder HTML comment, which is processed later on during the render by this code, which replaces the comment with the appropriate web control. Next : Dynamics 365 Portal Developers – Don’t Forget About CSS!